May Day festivities in Seattle yesterday were marred by a group of about 50 protesters who began to smash windows of downtown shops and offices. 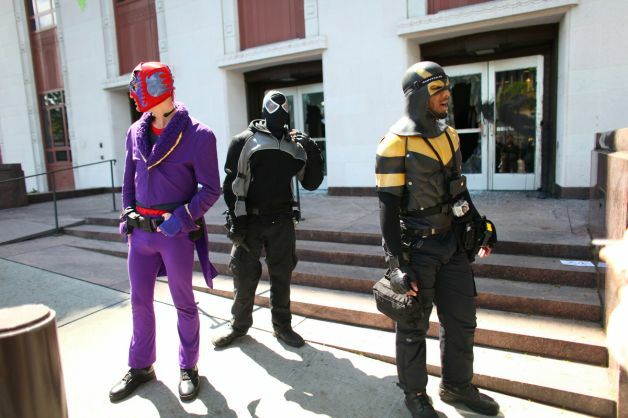 The protesters were about to make their way to the former courthouse on 5th street, but they were confronted by a team of Seattle’s costumed crusaders, Phoenix Jones, Midnight Jack, and the Caballero. Initially there were some reports that Phoenix Jones had used his pepper spray on the protesters, but after further investigation, these claims proved incorrect by the footage from Jones’ personal camera. This footage was later given to police in hopes of identifying some of the May day vandals. Success such as this may not be enough to convince some citizens that Phoenix Jones and his ilk are good for Seattle. Local supervillain Rex Velvet has posted a video message on youtube about his mission to put a stop to any costumed shenanigans in his city. Whether he is simply a concerned citizen, or if this is simply a set up for a dastardly form of performance art, only time will tell.